At ISE, Australian manufacturer iMAGsystems will demonstrate two new products for transporting video over networks, Lighting and Thunder. Lightning, an advanced encoder/decoder, delivers uncompressed, zero-latency digital video at up to 4K resolution using standard 10GbE infrastructure; Thunder utilizes JPEG2000 compression to send audio and video over standard 1Gb networks. Based on the AptoVision Blue River NT2000 chipset, Lightning brings a high level of exibility and scalability, routing high-resolution video to multiple destinations retaining every detail of the original source. The system allows video walls of up to 5x5 (25 displays), and any combination of asymmetrical matrix switching can be accommodated within the one system. New features include multi-source video compositing, video wall processing with bezel correction, broadcast-quality scaling, and support for IP-based switching and extension of true 4K/60Hz (4:4:4) video over 100m of Cat-x. The NT2000 chipset is also HDMI 2.0 and HDCP 2.2 compliant, and supports the transmission of audio, GbE, 480Mbps USB 2.0, RS-232, and IR. Designed from the ground up for pro AV applications, Thunder employs JPEG2000 video compression, making it well suited for balancing video quality and latency across applications such as venues, corporate environments, and teaching facilities that require very low latency. 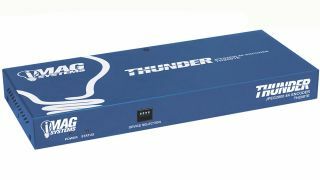 Delivering on the potential of simplified video-over-IP systems, Thunder is engineered to be straightforward to commission with easy network switch configuration and step-by-step device setup. Designed for closed independent networks but with a feature set that works equally well for enterprise deployment, Thunder is well suited for applications such as video walls, point-to-point, and matrix, and handles nearly all video resolutions up to and including 4K video. It further allows the mixed use of 4K and 1080p displays, automatically downscaling 4K sources to maximise compatibility with older 1080p displays.